At this point, I believe I only have two chapters to go. 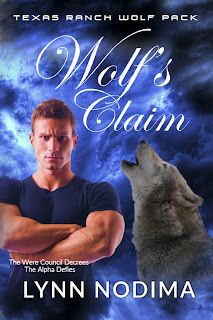 This means my new book in the Texas Ranch Wolf Pack series, Wolf's Claim, will be published on or before the July 15th deadline I set for myself. You might have noticed I changed the cover again. I won't claim that I have decided on the final, final cover again, but I hope this is the last revision. Let me know below what you think of it. I had to stop writing a few times to do some research. Even so, there may be factual errors in some places. If so, it was not for lack of trying to find information. I have also been studying the craft of writing more. This is a study I started over 20 years ago, and I am always thrilled to learn more. 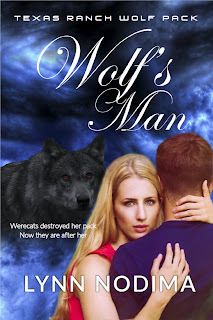 If you haven't read the first in series, Wolf's Man, it's available in Kindle Unlimited. If you have a Kindle Unlimited subscription, you can read it free. If not, the price is $2.99 for the Kindle version. You can find it on Amazon.com or you can click on the image at right. Wolf's Claim has published! Find it on Amazon.com.